From the Hancock County Courthouse, go southeast on Hwy 15 for 2.3 miles to Shoal Rd which forks off on the left. Go on Shoal Rd for 1.8 mile to Road 62, which forks off to the right. Follow Road 62 for 0.4 mile to the cemetery on the left. The cemetery is at the crossroads of Road 62 and Maggie Reynolds Rd. Graves numbered 350 and higher have been added since the initial survey and are largely based on obituaries. 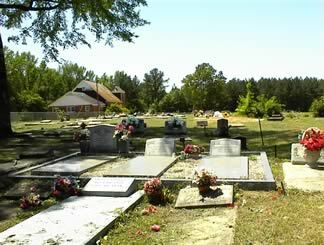 They are believed to be located somewhere within the cemetery. Gather in God's care. On same headstone with Rosa M. R. Chappel. Gather in God's care. On same headstone with Jessie J. Chappel. Information taken from funeral home marker. Three graves marked by fieldstones. Oliver Son of James & Lucy Andrews. Although he sleeps his memory doth live/And cheering comfort to his mourners give. He followed virtue as his truest guide Lived as a Christian/ As a Christian died. In love she lived,/ In Peace she died;/ Her love was craved,/ But God denied. w/o W.M. Smith. He followed virtue as his truest guide, Lived as a Christian, as a Christian died. On same headstone with Sallie Boone. On same headstone with Frank Boone. Son of C.J. & Teresa Laughlin. Here is one who is sleeping in faith and love/ With hope that is treasured in heaven above. GA PVT Co 1 810 Pioneer INF. Age 30. Gone home. Headstone leaning on stump. No birthdate. Broken headstone lying next to marker for Daniel Reaves. No birthdate given. Grandson of Frank Lawson (per Harrell Lawson). No other dates given. Monument is broken. Georgia CPL 1940 Engr Avn (?) Util Co.
Born in Georgia. No dates given. No death date as of February 2003. Great granddaughter of G.W. Battle (per JoAnne Smith). Age 82 (Notation on funeral home tag). Age 41 (Notation on funeral home tag). w/o Frank Lawson (per Harrell Lawson). A Good Follower & A Good Leader. Dates on funeral home tag: (unreadable) 17, 1925 December 6, 1927. No birthdate given. Death month/day unreadable, last digit of year questionable. "Nov 31" is the date engraved on the marker. Graves 227-234 enclosed in fenced lot. "Father". Graves 227-234 enclosed in fenced lot. A Virtuous Woman. Graves 227-234 enclosed in fenced area. In fenced lot with Walter Reaves. In fenced lot with Annie B. Reaves. Loose headstone. "Apr 31" engraved is the date engraved on marker. Possible grave - fieldstone marker. In fenced lot with Josephine Lewis. In fenced lot with Madison Lewis. Georgia Tec 4 U.S. Army. Information taken from funeral home tag. Not found in 2003. All info per Kimbrough list.